As I’ve mentioned before my book reviews are not meant to be a comprehensive dissertation about the book. I prefer to provide the simple premise and my own perspective about the writing. The premise behind this book is that we have a tendency to talk ourselves out of pursuing good ideas because our primary focus is on protecting ourselves from things that take us out of our comfort zone. Mel Robbins talks about a hack that breaks this pattern of fear or procrastination by counting backwards from 5 to 1 and then taking action. This breaks the pattern of letting our mind talk ourselves out of doing something in response to the idea we have. Most of this book is about having the courage to pursue your dreams and explaining all the ways to overcome sabotaging yourself. Let me say that for me the book was very inspirational, and may for you act as a trigger to start pursuing your dreams. She includes lots of quotes from readers on how they changed their life, and some pretty cool quotes on pages you can rip out and put on the wall in your home office for instance. It is an easy read that you could accomplish in a weekend, a little over 200 pages. I would certainly recommend it if you are considering making some changes in your life and need a little push in the right direction. I’ve posted a couple different times on how Monday is the ideal day to set a goal that you will work towards or maybe achieve depending of course on the nature of what you are seeking. My own score card is I have completed two of the three goals I set for myself. Instead of taking my own advice I set goals that were very difficult so 2 out of 3 is not so bad, and I have made some progress on the one that I cannot say I have completely mastered. This brings up another point about goal setting that we need to understand. It is vitally important that you set the goals so that you can begin to change your behavior, but realistically you will not always achieve them in the time frame you set for yourself. 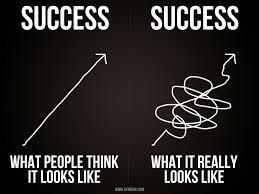 I’ve always liked the graphic below because it does a good job of simply depicting what really happens when we set a goal and work toward achieving it. Sometimes reaching your goals and the resulting success this brings you is a messy process, so I wanted to make sure you cut yourself some slack during this whole process. I found myself questioning the order of goals I set for the 4 or 5 weeks, re-ordering them, and even eliminating some to better suite my true desires when it comes to work and my personal life. I’m sure you will do the same as you make adjustments as you think about what you really want to achieve. While it is true that we will all struggle to achieve our goals, it is no reason to hesitate to move forward. The very fact that you may find the goals you set difficult to achieve means that you have set worthy goals. Continue to have faith in yourself and your dreams. Don’t fall back into old patterns of behavior as every Monday brings with it a new start, a new goal, and change.